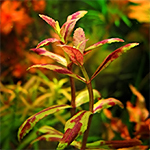 Limnophila sp. 'Belem' is a very attractive mid-ground plant. It also works well as background plant. Limnophila sp. 'Belem' branches nicely and is easy to propagate. This plant has a very nice color and serrated leaves. This plant is considered a moderate plant to grow. CO2 is needed for nice growth but not necessary for sustained growth. Under higher light it can get a purple color bleeding through the green leaves. You will get 3 stems.